What is a high-velocity water jet? A high-velocity water jet uses water pressure to flush and emulsify debris in pipes. 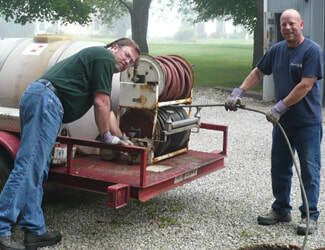 This is an efficient and environmentally safe way to clean drain and sewer pipes. A water jet uses water pressure to clean drain and sewer lines by propelling varying amounts of water through a flexible hose into the drain. This direct and concentrated stream of water is able to scrub away years of built up sludge, grease, and other debris on the inside walls of pipes. What is the difference between a cable machine and a high-velocity water jet? Cable machines are used to remove tree roots and break through solid obstructions. High-velocity water jets are able to remove softer blockages including grease, sludge, and overall buildup. What does it cost to use the high-velocity water jet? The cost of the high-velocity water jet, including one load of water, up to one hour of jet work, and drain cleaning, is $200. This cost also includes two Charlie’s Drain technicians. If additional water or hours are needed or there are any services necessary to finish the job, a Charlie’s Drain Service technician will update you on the price before proceeding.